Unlike @Clint I don’t resort to little kid gimmicks with libtard jokes. able to convince any D’s to vote with them. Exactly I truly hate how ugly the political scape has turned honestly. It’s ugly & everyone wants to be verbally aggressive towards each other. I love to debate & disagree with someone. I love to hear your points if you have intellectual points to make. We don’t need to trash each other just to voice our own opinions. Media definitely hasn’t helped either just pumping up this type of rhetoric just to maximize their viewership. When did politics resort to actually getting physical? We are a civilized modern day society and need to act like it. People will disagree with each other and that’s ok but to be verbally abusive to each other is a no-no. What’s all this about the US government being involved in drug smuggling? And who do you suspect is in league with the drug cartels? It happened with the CIA sponsoring the “secret war” in Laos (it was accused of openly trafficking heroin). Obviously that is just speaking on a branch of gov’t but as a whole if that can happen on a smaller scale it could happen on a larger scale with people being overt. I would say it be naive to not think that big players have profited off these type of dealings. It can be happening right now and we would never know. It’s not like transparency into things like that are apparently aware. It’s more of a he say/she say sort of thing. It’d be hard for me to say a “who” as I believe that would be an entity/group. Every government has its secrets. I’ll definitely ponder on that though. Laos. CIA secret war operations in Laos were ended over 40 years ago. Yes I know. What I’m saying is even if the government were/are participating it’d be much HARDER now to connect the dots. This is not only speaking in America, I’m pretty certain governments all over the world are dealing in nefarious activities and profiting off of illicit gains. We are to abide by the rules, be governed by the rules, but again wheres the oversight for those creating the rules? I don’t want to go off in a tangent and sound like a wacko. I’m just more open to the possibility that transparency isn’t exactly warranted in this day and age. It would be easy for any government around the world to hide crap if they truly want to. The federal government is partially shut down, ostensibly over President Trump’s proposal to construct a wall along our southern border, and his request for $5.7 billion over 5 years to fund that construction. 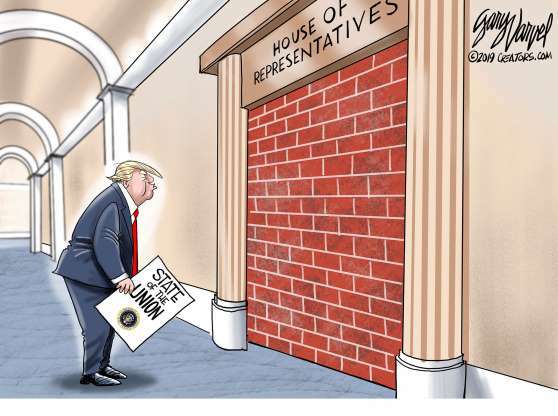 The fight going on between the President and the Democrats (I prefer to call them Dummocrats) in the House and Senate has nothing to do with the proposed wall, or with its (relatively minor) cost. Rather, this fight has everything to do with the attempt of the Dummocrats to thwart ANYTHING this president wants to accomplish. This fight is personal, and it’s stupid. 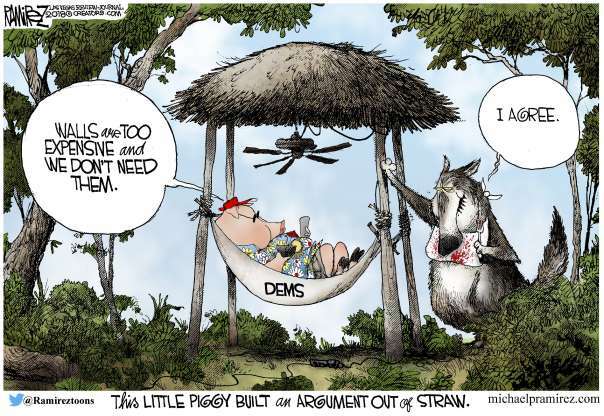 The Dummocrat Party, led by Speaker of the House Nancy Pelosi (I prefer to call her Nasty Pelosi) and Senate Minority Leader Chuck Schumer (I prefer to call him Schmuck Schumer) has refused to create and submit to the president a budget (as law requires them to do), and have instead proposed another in a long string of Continuing Resolutions to fund the government for a couple of months – provided there is no money allocated for a wall on our southern border. President Trump has indicated that he will veto such a bill, should it arrive on his desk, and the Dummocrats have withheld formally submitting such a bill. Without a signed Continuing Resolution, there is no money to fund certain functions of the federal government, deemed “non-essential”. The president has asked the Dummocrats to negotiate, in good faith, a resolution to the impasse between them. The Dummocrats have refused. 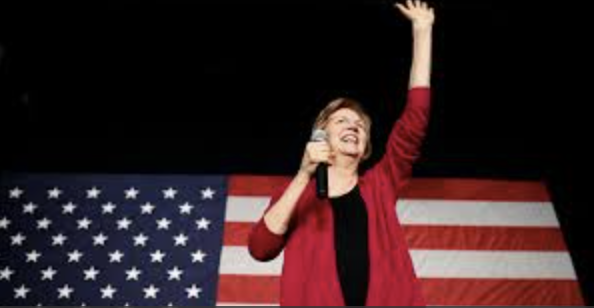 The Dummocrat position is: Fund the shut-down portions of the government for a few months first, and then we’ll talk about the sourthern border. In other words: Give us everything we want, and then we will talk to you about what you want. The president has told the Dummocrats where to stick that suggestion. 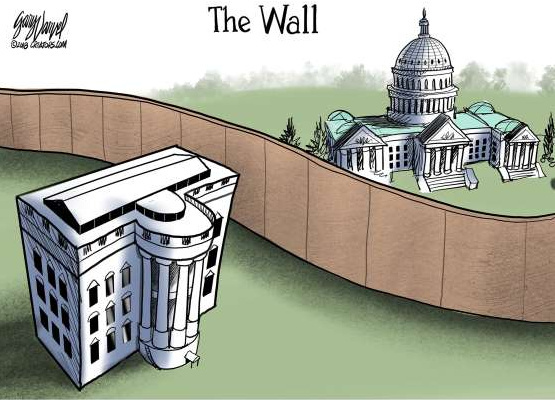 So, we now have a “wall” between two branches of government. And we have a stand-off which might continue for longer than anyone imagines. The Great Wall of China and Hadrian’s Wall needed so much money/military personnel to maintain and patrol that when each empire had problems it gradually was unable to keep up the effort. A poorly staffed physical border is ineffective, so unless successive governments will also commit equal budgets to staff and adequately maintain a physical border, then the building of it will be a waste of public money. Anyone who watched the news conference at the southern border may have picked up on border patrol’s nifty little statistic, where there is wall illegal crossings make up 6% of overall traffic, and where there is no wall it is 94%. That isn’t a political talking point from any party. That is data from border patrol records. Walls work, but they have to actually exist to be effective. The cost of the wall is peanuts to the US. Its shameful for any country to have an unsecure border. Here is an EXTRAORDINARY ARTICLE, published yesterday in The Daily Caller, on what’s really at stake in this partial government shutdown. Credits to Rush Limbaugh for alerting us to this article today on The Rush Limbaugh Show. The Daily Caller is taking the rare step of publishing this anonymous op-ed at the request of the author, a senior official in the Trump administration whose identity is known to us and whose career would be jeopardized by its disclosure. But President Trump can end this abuse. 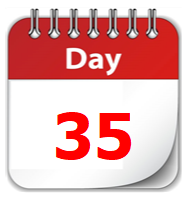 Senior officials can reprioritize during an extended shutdown, focus on valuable results and weed out the saboteurs. We do not want most employees to return, because we are working better without them. ^^Looks real credible. Any who lets see how long this crappy shutdown last. But the real and ongoing source of Democrats’ outrage is that President Trump has continually and, it must be said, gleefully, skewered the establishment. He has challenged the conventional wisdom on nearly everything, revealing the shallowness of the group-think that has so long dominated our political discourse. He has, in particular, stomped on the insufferable bloom of political correctness, delighting common-sense Americans who think that men, as well as women, deserve due process on college campuses, who imagine that school choice is truly a civil rights issue and who think that the sliding norms of behavior and decorum in our country are a negative, not a positive. Worse, he has accomplished a great deal that should please all Americans, following through on promises to revive our manufacturing industries, make the U.S. more competitive, enact criminal justice reform, improve accountability at the Veterans Administration, boost consumer and business optimism, confront the Chinese over trade malpractice and other misdeeds, bring North Korea to the bargaining table, prod NATO to pay its fair share, rid the country of suffocating red tape, defeat ISIS and put people back to work. They get everywhere don’t they ? “Bremainers”, eco-fascists, evangelising vegans - what hope is there for decent people when the wreckers are everywhere ? provide a window of opportunity for negotiators from both parties to craft a compromise on a Continuing Budget Resolution which will provide funds for a physical barrier on our southern border. 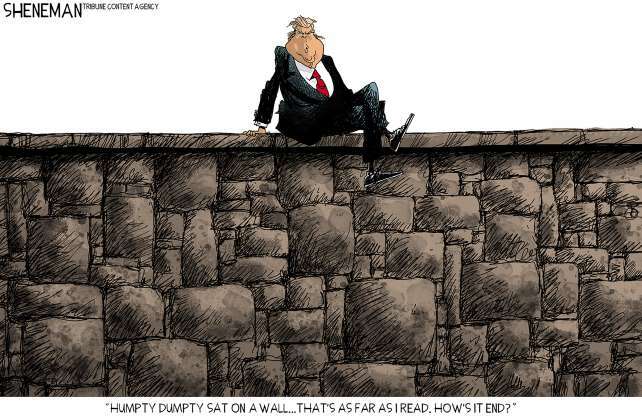 or – the President will use the powers granted to him by law to declare a National Emergency, and will direct funds from the Defense budget to the construction of physical barriers along critical portions of the southern border. The ball remains in the Democrats’ court. At any time, they can choose to set aside their trump-derangement syndrome, and end this stupid stalemate. But, to do so will require a measure of concern on their part for the welfare of this nation which has been lacking for quite some time. The US does not operate an open-border policy. Mexico and several Latin American countries have scarily high violence and corruption. The US needs as complete a physical barrier on it southern border as possible. The construction costs requested amount to about 12-hour’s worth of US government spending. I cannot understand why the President’s opponents would pick this issue for a contest.